Since your app is running on user device, it is quite possible that your ApiKey/SecretKey can be used by untrustworthy user of your app and can be misused. App42 platform offers different way of securing your app however it totally depends on application type and its data. Here are the two main technique to apply ACL on user data and method level calls. If still have concern about security, please feel free to write us at support@shephertz.com and we will surely address it. Primary requirement with ACL enablement is to have your user registered with App42 platform. Here are the few steps to apply ACL on your app data. Give default ACL permission, for example PUBLIC/READ or PUBLIC/WRITE or PUBLIC/ALL. Default ACL will be used to put access in case any record/document is created by user if specific ACL has not been passed along with records. You will get ApiKey/SecretKey along with AdminKey. Once ACL enablement is done for your app, now whenever a call is made for user data, it should come from authenticated user. (Click to know about how to do User Authentication ?). If request contains AdminKey it would be considered as administrative call and would have access to all app data. 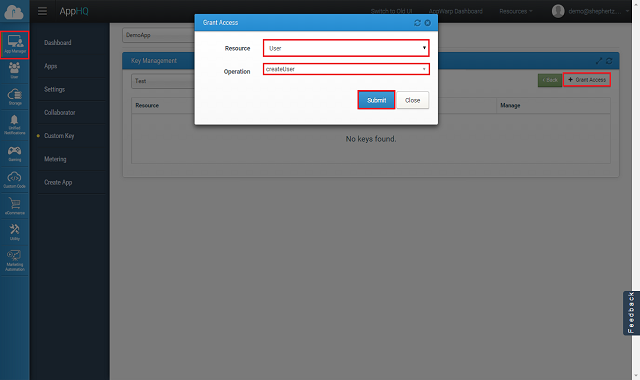 If it is coming from user and does not contain AdminKey, it would be checked for access on target resource. If user is authorized to access the resource, it will succeed otherwise Unauthorized Exception will be thrown. Any user data created using AdminKey would be considered as data owned by admin user. In ACL enabled app, it is required to pass sessionId of user who is making call. Session Id is used on the server to determine the user and checking for authorization. Session Id can be fetched once user is authenticated as shown below. It uses method call updateEmail for user, however it can be replaced with any other user API call and mechanism will remain same. If you are using facebook for user integration, you have to pass facebook access token in your API call instead of sessionId. In this case you dont have to call authenticate method as your user authentication is done with facebook. //call setFbAccessToken instead of setSessionId if you are integrating with facebook for user base. Your admin key of app has got privilege to create/modify/delete data of your app user and app data as well. You have to pass AdminKey in the API call to give it administrative privilege as shown below. // Now call any method for example Update Email. Passing admin key will give this administrative privileges. Granting Access on given resource or document can be done by using grantAccess method available in respective service. Here is a snippet to grant permission to given user on JSON object stored in specific db and collection. App42 provides hundred of ready made methods that can be used from your app. Since your ApiKey/SecretKey is distributed with App, it is quite possible that any potential hacker can see your ApiKey/SecretKey inside your app and can make a call to all of the APIs available in App42. You can very well handle this scenario by creating separate key for your app and only giving access to required API methods to it. For example, you can create a separate ApiKey which will only have access to create user and authenticate user method of App42 APIs. Rest of the method will not be accessible to this ApiKey. 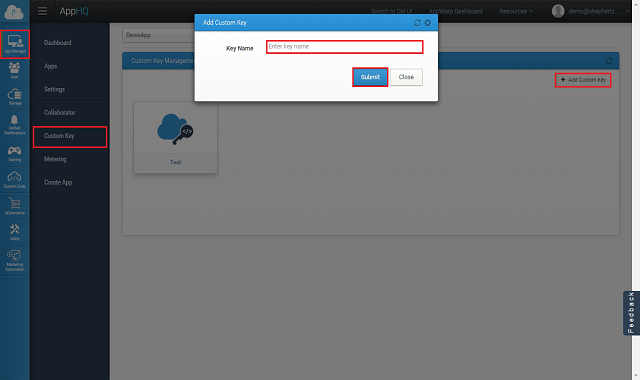 Here are the few steps to create new custom ApiKey and giving method access to it. Pop up will be opened and it will ask you to select Resource and operation from drop down. Here service might be User service and operation might be createUser, if you want to give the access for createUser to this ApiKey. Similarly you can give multiple access to created key.